For the children's television series, see The Adventures of Portland Bill. Portland Bill is a narrow promontory (or bill) at the southern end of the Isle of Portland, and the southernmost point of Dorset, England. 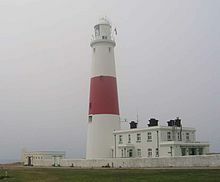 One of Portland's most popular destinations is Portland Bill Lighthouse. Portland's coast has been notorious for the number of shipwrecked vessels over the centuries. The dangerous coastline features shallow reefs and the Shambles sandbank, made more hazardous due to the strong Portland tidal race. The Bill is an important way-point for coastal traffic, and three lighthouses have been built to protect shipping. The original two worked as a pair from 1716, and they were replaced in 1906 by the current one. From Roman times, beacon fires were lit to warn ships of the danger of the Bill. A petition to Trinity House was put forward for a lighthouse in the early 18th century, but Trinity House opposed it. They later conceded that a lighthouse was needed and George I granted the patent on 26 May 1716. Trinity House issued a lease to William Barrett and Francis Browne to build and maintain one or more lighthouses. One lighthouse was built at Branscombe Hill, while the other was situated on lower land. The two lighthouses were lit for the first time on 29 September 1716. The lights were poorly maintained, and Trinity House terminated the lease after an inspection in 1752. In 1789, the Old Lower Lighthouse was demolished and rebuilt. In 1844, Trinity House erected a stone obelisk at the southern tip of the Bill as a daymark, and the first lightship was placed at the Shambles sandbank in 1859. In 1869, Trinity House had both lighthouses rebuilt. Pulpit Rock is an artificial stack of rock that was formed in the 1870s by quarrying operations at the Bill. At the turn of the 20th-century, Trinity House put forward plans for a new lighthouse which was completed in 1905 and first shone on 11 January 1906. The original two lighthouses were decommissioned and sold. The Old Lower Lighthouse later became a bird observatory in 1961. The Old Higher Lighthouse was owned by Marie Stopes from 1923 to 1958 and is now a holiday let. A proper road to Portland Bill was laid in 1922 and this helped the Bill become a tourist destination. A coastguard lookout at Portland Bill was built in 1934. It closed in the 1990s but was taken over by the National Coastwatch Institution, which rebuilt the station in the 21st century. During the 1960s, the Ministry of Defence Magnetic Range was built at the Bill. Farther up the hill at Branscombe was a Royal Navy Wireless telegraphy station which was established in the early 20th century and closed in the 1990s. The Shambles lightship was permanently withdrawn in 1976 and replaced by automatic buoys. The current lighthouse was unmanned in 1996 and all monitoring and control transferred to the Trinity House Operations & Planning Centre in Harwich. The lighthouse has a visitor centre, while tours are conducted to take visitors to the top of the lighthouse. The lighthouses, Pulpit Rock and the Trinity House Obelisk are Portland Bill's key attractions. Close to the MOD range at the Bill is Portland's main Raised Beach. A fishing crane, known as Red Crane, is situated on the cliff edge at Portland Bill. The area holds many beach huts. There are a few commercial businesses in the area, including a restaurant - The Lobster Pot - and a pub - The Pulpit Inn. Portland Bill has a number of buildings which are Grade Listed. The current lighthouse, along with its boundary walls, is Grade II Listed. The Old Lower Lighthouse, including its boundary walls and coastguard house, is also Grade II Listed, as is the Old Higher Lighthouse, its four cottages and boundary walls. A 19th-century Fisherman's hut is Grade II Listed, while Red Crane, part of a disused stone loading quay, has become a scheduled monument. The surrounding fields between the Bill and Southwell are made up of an ancient strip field system, once found all over the island. They date from Saxon times. The nearby Culverwell Mesolithic Site is a Mesolithic settlement, located along the Portland Bill Road. The site is said to be circa 7500-8500 years old and has also become a scheduled monument. This includes surrounding fields, also relating to the Mesolithic period, and these fields lead across to the coastline. Portland Bill is home to a range of wildlife, such as this protected sand lizard. ^ a b c d e f "Portland Bill Lighthouse". Trinity House. 1996-03-18. Retrieved 2018-03-05. ^ a b c d e "Portland – Three Lighthouses Walk". dorsetlife.co.uk. Retrieved 13 June 2015. ^ Legg, Rodney (1999). Portland Encyclopaedia. Dorset Publishing Company. p. 68. ISBN 978-0948699566. ^ a b c "Portland Year Book". ancestry.com. Retrieved 13 June 2015. ^ "Portland Year Book". ancestry.com. Retrieved 13 June 2015. ^ "Portland Bill". www.geoffkirby.co.uk. Retrieved 2016-04-09. ^ Mackenzie, Roy (1999). Portland: A Topographical and Historical Gazetteer. p. 23. ^ Keith Pritchard. "Portland Bird Observatory - index". Portlandbirdobs.org.uk. Archived from the original on 30 November 2012. Retrieved 24 November 2012. ^ "History of the Old Higher Lighthouse - Old Higher Lighthouse, Portland Bill, Dorset". www.oldhigherlighthouse.com. Retrieved 2016-04-09. ^ Morris, Stuart (1985). Portland: An Illustrated History. Dovecote Press. p. 121. ISBN 978-0946159345. ^ "Geograph:: Coastguard station, Portland Bill (C) Hugh Venables". www.geograph.org.uk. Retrieved 2016-04-09. ^ "&nbspg4usb Resources and Information". G4usb.net. Retrieved 2018-03-05. ^ "Portland Churches, Buildings and Views". www.pbenyon.plus.com. Retrieved 2016-04-09. ^ a b "North of Portland Bill, Portland, Dorset". Geoffkirby.co.uk. Retrieved 25 November 2012. ^ "Portland Bill". Geoffkirby.co.uk. Retrieved 2018-03-05. ^ "Lower Lighthouse, Portland, Dorset". Geoffkirby.co.uk. Retrieved 25 November 2012. ^ Historic England. "Details from listed building database (1280498)". National Heritage List for England. Retrieved 26 June 2014. ^ Historic England. "Details from listed building database (1280466)". National Heritage List for England. Retrieved 26 June 2014. ^ Historic England. "Details from listed building database (1203104)". National Heritage List for England. Retrieved 26 June 2014. ^ Historic England. "Details from listed building database (1280495)". National Heritage List for England. Retrieved 26 June 2014. ^ Historic England. "Details from listed building database (1002388)". National Heritage List for England. Retrieved 26 June 2014. ^ Historic England. "Details from listed building database (1002406)". National Heritage List for England. Retrieved 26 June 2014. ^ Historic England. "Details from listed building database (1002729)". National Heritage List for England. Retrieved 26 June 2014. This page was last edited on 4 November 2018, at 12:50 (UTC).